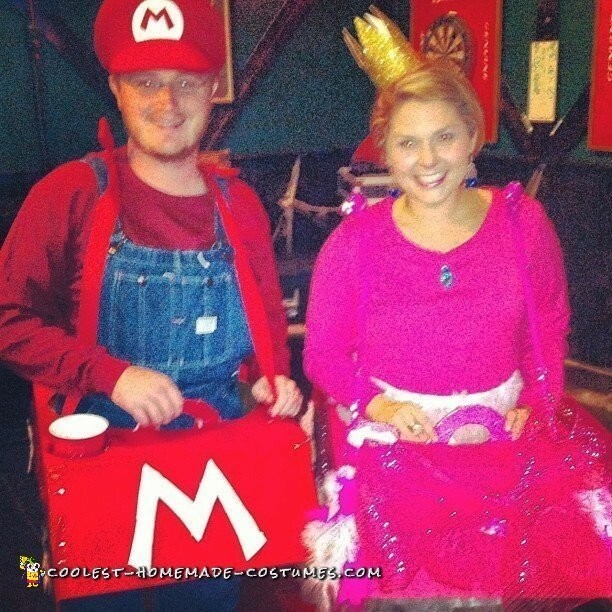 We came up with this Mario Cart and Princess Peach couple costume idea a week before we needed it. We only had 6 days to draw it out and start working. We spent every night after work spray painting, gluing, running to the store, pinning, running back to the store and panicking. 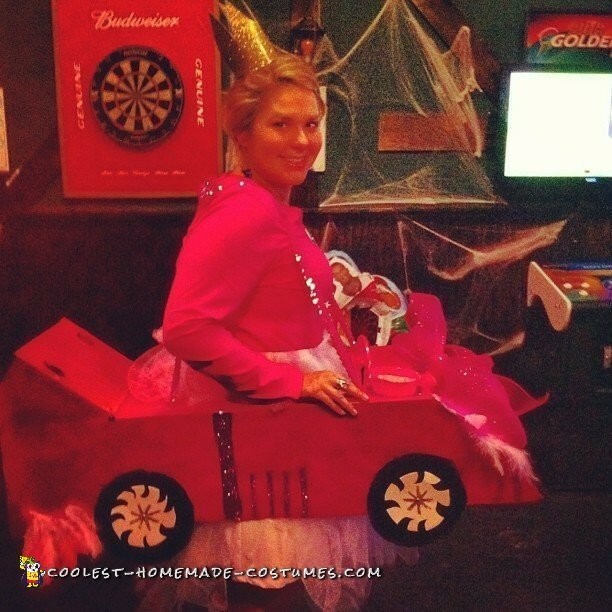 We created spinning rims, cup holders, flames out of the back of the carts, and giant glitter bows for these. 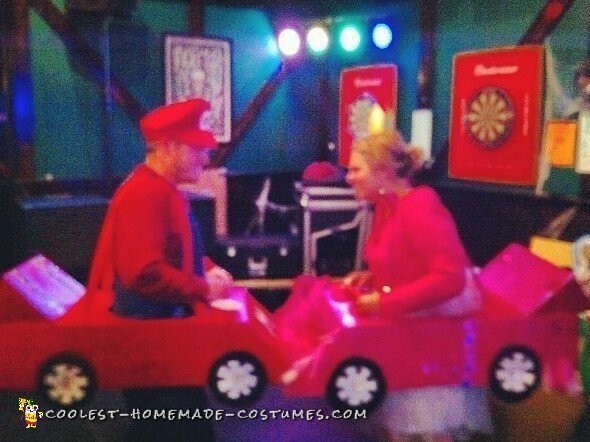 My husband and I put so much into this Mario Cart and Princess Peach couple costume and loved every minute of it. The funniest part was how we somehow painted the garage door glitter pink with feathers in the process. My husbands dirt bike now has pink stripes on the fender. Oops! When we arrived, we had great responses from our friends. 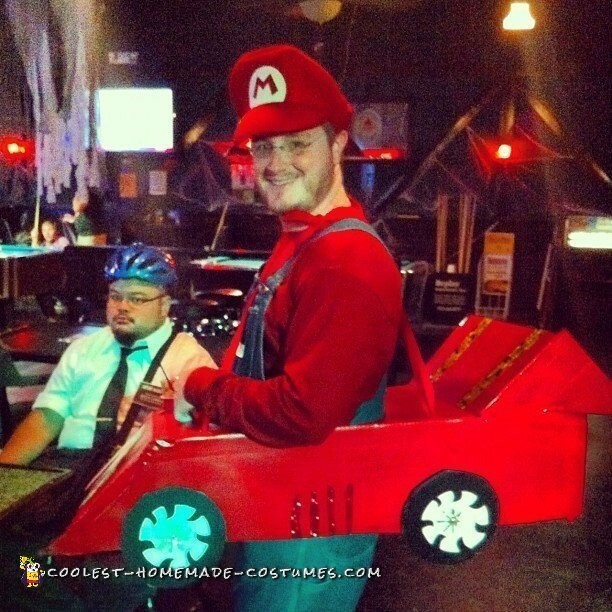 At the party, we placed our drinks in the cup holders of the carts and chased each other around the place acting like we were actually racing. It was amazing! Everyone wanted pictures with us. We knew then we had really made something super special! We ended up wining first place at our local bar for the event! 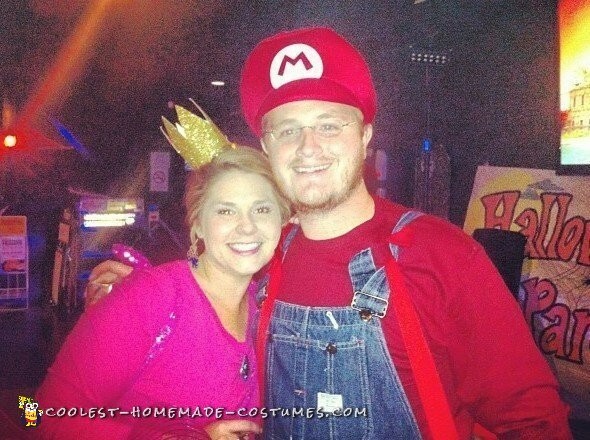 We wore this Mario Cart and Princess Peach couple costume to two other parties in the same weekend. We put too much work in the costume to just wear it one time! We placed second at one of them and an honorable mention at the other. The hardest part of these costumes is going to be throwing them away. They need major repairs and a lot of space to keep these in and hope that they don’t get damaged! If we do this again another year, we will attempt to convince our friends to join in and create the other characters with us. We will send in pictures if we can make it happen!